WASHINGTON, D.C. – The Hispanic Association of Colleges and Universities (HACU) today applauded creation of a new Congressional task force created to open more doors in Corporate America to Hispanic leadership. 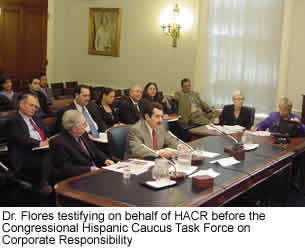 Flores, who also is Chair of the Hispanic Association on Corporate Responsibility (HACR), testified today in Washington, D.C., before the new Congressional Hispanic Caucus Taskforce on Corporate America on the lack of representation of Hispanics in leading employment, procurement, philanthropy and governance roles in Corporate America. The Congressional Hispanic Caucus is a leading voice on Capitol Hill for Hispanic education, health, employment, civil rights and other issues. “HACR and HACU share with the Congressional Hispanic Caucus the same mission to promote workforce diversity by our efforts to increase the ranks of qualified Hispanics with business degrees, and to expand employment opportunities for Hispanics in corporate management ranks,” Flores said. Flores praised the election of U.S. Representative Joe Baca of California as chair of the new Congressional Hispanic Caucus Taskforce on Corporate America. “Congressman Baca is a proven champion for the college and career success of Hispanic Americans and, indeed, for all Americans. We welcome his leadership on this important new task force,” Flores said. HACU represents more than 350 colleges and universities that collectively serve more than two-thirds of all Hispanic higher education students in the United States. HACR is a national coalition of the 11 largest and most influential Hispanic organizations in the United States and the nation’s preeminent voice in research on diversity in Corporate America. 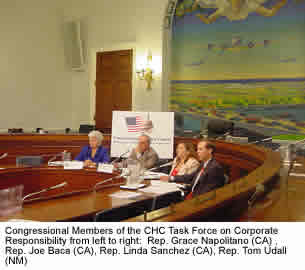 “HACR believes it is essential that the economic benefits reaped by Corporate America be shared with the communities that help create these benefits for corporations and their shareholders,” Flores testified. Each year, HACR publishes a Corporate Governance Study, which details the progress of Hispanics on boards and in the executive suites of America’s largest corporations. HACR also leads initiatives to track, train and inform Hispanic executives regarding leadership opportunities. HACR’s 2003-2004 Corporate Governance Study reports that Hispanics hold less than 2 percent (1.8 percent) of Fortune 1,000 board seats, despite the fact that Hispanics make up nearly 15 percent of the U.S. population and nearly 13 percent of the civilian labor force. Hispanics represent 10.7 percent of the private sector labor force, but only 4.7 percent of private sector officials and managers – and just 1 percent of executive officers. “Even more sobering is the exceedingly low proportion of Hispanic executive officers, a meager 1 percent, because it indicates that there are actually fewer Hispanics in the pipeline than serving on boards,” Flores testified. For example, only 21 Hispanic women serve on Fortune 1,000 boards, while even fewer – only seven – Hispanic women serve as executive officers at Fortune 1,000 companies. Still, the meager numbers for overall Hispanic representation in corporate leadership roles reflect a 140 percent increase in the number of Hispanics serving on Fortune 1,000 boards in the past decade. The number of companies with Hispanic directors also has grown by 186 percent since 1993 – the first year HACR began research in this area. Currently, 16 Hispanics serve as chair, president, CEO or COO of Fortune 1,000 companies. “These changes are due to a growing realization that it is imperative to seek directors from under-utilized and under-represented talent pools,” Flores said. “Globalization, changing demographics, a burgeoning Hispanic purchasing power and corporate scandals are major factors in this transition, as corporations recognize the relationship between high performance and workforce diversity, as well as the importance of independent board member input,” Flores said. HACR has found that companies with Hispanic members on their boards of directors tend to perform better, Flores testified. The HACR Governance Index outperformed the other companies by a wide margin, posting a 17.5 percent rate of return for the period, compared to 4.6 percent for the Dow, -25 percent for the NASDAQ and -7.3 percent for the S&P 500 posted by the other companies. Flores praised the Congressional Hispanic Caucus for creating the new task force. “I look forward to working closely with the task force to accelerate the goal of equitable Hispanic inclusion in Corporate America,” Flores said. For more information, contact HACU at (210) 692-3805. Ext. 3214. Or visit www.hacu.net. For more information about HACR, visit www.hacr.org.